Place the egg yolks with half of the sugar in the bowl of the planetary mixer, adding 300 ml of warm water a little at a time. Whip the egg whites separately with the salt and when they begin to foam add the remaining sugar. Whip until stiff, transfer them into a metal mixing bowl and fold in the yolks. Mix well and add the sieved flour and then the cocoa powder. Spread onto a baking sheet, forming a thin layer, and bake at 250°C for 5 minutes. Cool and set to one side. Bring the water to the boil with the sugar and glucose in a saucepan. Cool and add the rum. Pour the liquid into a covered container and set to one side in a cool place. Bring 25 g of cream to the boil with the milk, inverted sugar and the open, grated vanilla pod. To intensify the flavour, it is best to make this infusion the day before and allow it to stand for at least 12 hours. Whip the remaining cream in a bowl. Break up the coating chocolate roughly. Lightly beat the egg yolks and pour them over the infusion. Cook the mixture as you would custard, heating to a temperature of 85°C. Take the saucepan off the heat, pour the mixture over the broken chocolate, place in a Thermomix and homogenize at about 30°C until a light ganache is obtained. Fold a small amount of whipped cream into the ganache and mix gently with a silicone spoon. Add this mixture to the rest of the whipped cream and mix gently, until a smooth, shiny cream is obtained. Wet the gelatine sheets in cold water. Heat the water with the sugar and powdered milk, stirring thoroughly. When the mixture is hot and the powdered milk has dissolved, add the cocoa and cream. Heat the mixture to 102°C. Take the saucepan off the heat. Dry the gelatine sheets between two sheets of kitchen paper. When the mixture has cooled to 50°C, gently fold in the drained gelatine, not agitating too much to avoid creating bubbles. Cut the biscuit into rectangles measuring 7 cm long, by 1 cm thick and wide. Soak these “ingots” in the rum syrup for 20 minutes, then remove and leave to drip on a rack. Pour a layer of chocolate mousse into four strips measuring 1 cm thick inside rectangular silicone moulds measuring 8 cm long by 3 cm thick and wide. Delicately press 4 rum-soaked “ingots” into the mousse. Add more chocolate mousse until the mould is full and cover the filling with rum-soaked biscuits. Place in the fridge. Gently heat the icing, until it just starts to melt. Coat the mousse-covered biscuits. 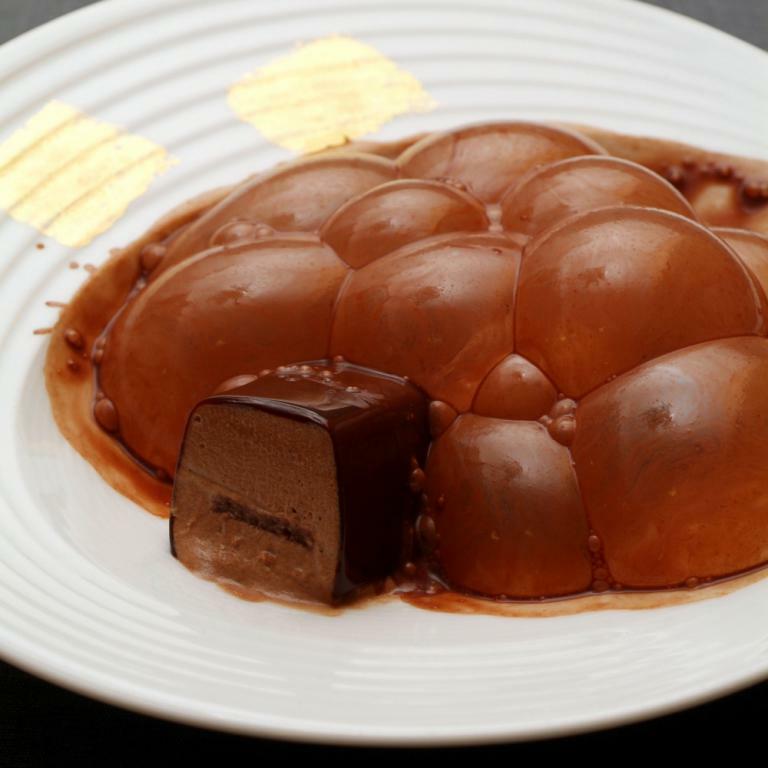 The result is a “cake” consisting of liqueur-soaked biscuit, chocolate mousse and glossy icing. Mix the cocoa with 950 ml of water in a metal mixing bowl, stirring gently to avoid creating foam. Then pass the mixture through a fine sieve. Fold in the Xanthan gum, with the sugar and salt. Pour the mixture into a blender and blend on a low speed to combine the mixture. The rotation of the blade must be so slow as to only just form a whirl in the container. Pour the powdered egg white into another metal mixing bowl. Mix very gently with the rest of the water (50 ml), drizzling it in slowly and pressing a pestle around the inside of the container in order to crush the mixture. Leave to rest for 10 minutes, then start crushing again to homogenize the mixture without creating air bubbles. Pour over the liquid already in the blender beaker and blend for 20 minutes. Place the mixture in a vacuum-sealed container to eliminate any bubbles and place in the fridge at a temperature of 8-10°C until required. Place the almonds in the solids tray and the milk, with the sugar, in the liquids tray of a machine for making soya milk. Run the machine until the almonds have transferred all their essence to the milk. Leave to macerate for at least 12 hours. Filter through a sheet of fine muslin to obtain a liquid with no sediment. Leave to cool. This procedure can also be completed using a Thermomix. Dissolve the kuzu in the almond milk obtained (about 100 ml). Pour into a saucepan and hold over a very low heat, stirring with a silicone spoon and making sure that the mixture does not stick to the bottom of the pan. Take off the heat when the sauce gains a creamy consistency. Cover with Clingfilm and leave at room temperature. Dissolve the gold in the vodka and pour the mixture into a closed container with no holes. Cut out a shape of your choice from a sheet of polyethylene and place it on the edge of the plate. Then paint it using a small sponge dipped in the gold and vodka. Use a smoking pipe to introduce smoke made using beech wood shavings into a container with a 3 cm diameter hole in the lid. Close the hole in the lid in order to trap the smoke inside the container. Place a piece of the iced chocolate cake on the painted plate. Place a generous spoonful of almond cream next to it. Serve a little cocoa sauce at the bottom of the plate. Place the absorbent end of the tube of an aquarium pump in the container that holds the smoke and the other end in the bowl containing the pompas mixture. In this way we will obtain smoke-filled cocoa bubbles. Use a draining spoon to pick them up and lay them over the dessert. Serve immediately: the pompas will burst slowly in front of the diner.